He promised change and change he has proffered. He (Buhari) has delivered on his promise. He promised his people a return of leadership to the North, he delivered. He promised settlement for Boko Haram, now Shekau has gone on exile. He brought a dangerous wind of 'crush all oppositions', settle old grievances without mercy, invade, capture and posses the lands of those who never voted for you, make life unbearable for the masses, instill fear in their hearts, rule by dictate, threat and gun power. So, he has actualized varying degrees of change in a nutshell. Buhari's change has dazed Obasanjo and Tinubu into oblivion. He wades threats and detention like a wizard casting spells and now many are in detention awaiting trials, which are deceitful moves to illegally jail and weaken, as well as deaden parasatals that may pose danger. So far, he has delivered in corruption fighting. They brought in a military guru whose only learning is to kill opposition to fight corruption. Who else will he set to destroy but opposition? In the military, any moving object in battle is a target, so retributive justice is in play and the state mafian cabal, EFCC and DSS are hunting down victims as hunters in the bush hunting for meat. In this episode of victimizations, IPOB has suffered a great deal. We have what it takes, yet we lanquish and perish like helpless maggots wriggling for survival. What is happening with our system? If South Africa had waited until Nelson Mandela came out of prison, would they have sailed to freedom? Have our people's blood not watered the ground enough? What are we waiting for before we counter this steady movement against us by Nigerian government? Alas, my people, we are surrounded! Their coming to power was systematically planned and so far they are tactically progressing. The Nigerian leadership is majorly Northerners who want our lands, our wealth, our resources for themselves. Buhari has affirmed that the Sahara Desert is not favorable to them again and Boko Haram has destroyed a lot, so they need fresh lands. Hence, Fulani Herdsmen/Boko Haram invade our backyards and get away with it. Not even one of them has been caught or prosecuted yet. Innocent protesters, unarmed men and women who traveled down to Nkpor were all gunned down with impunity, while loved ones have gone missing, many are locked away to languish in Cells. Yet nothing has been done to the conniving and greedy governors who allowed their people to be slain. No squad is put in place to reprise this misdeeds meted out on us. They have tagged us terrorists already and they will never sit to negotiate. The deaf president says we were not born in 1967-70. He threatens us with war. 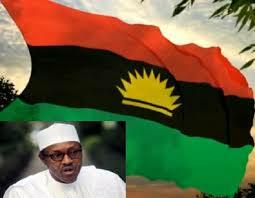 He stylishly conned a ceasefire from bombing militants and arranged killer squad against Biafra. He has armoury and personnel at his beck and call. What have we? He retired without cogent reason military personnels from the East who may oppose or defect to Biafran side and replaced them with his kinsmen, who have similar goals. The land, sea and air are controlled by Northerners. How will we fight from a tight corner, suppressed to the wall? They have arrested Ihejirika, they are after Ekwerenmadu, they have put Femi Fani-Kayode away, they are after Biafran business tycoons and our possible Allies. Even Ben Bruce has come under scrutiny. If they clip all these wings, How will we cope? Are we going to wait till we are drenched with this filthy rain? Now, the Federal Government of Nigeria has dragged the Imo state leadership to court. They claim to posses fifty acres of land supposedly bought in 1992, imagine what this is all about. Oil pipes traverse Biafra land, transferring our oil and gas to other lands. How many government infrastructure are in Biafra land? We have wealthy men and women all over the world yet our homeland is besieged by uncircumcised Philistines (Hausa/Fulani). The earlier we join hands in working towards the restoration of Biafra, the better chances of preserving our wealth and heritage. Biafraland is under siege and will be enslaved and Islamized if our people don't wake from their slumber and take back their land and freedom. Reading this great piece from Agangan gives me trepidation that we are already conquered. Few close friends from the north talk about it in a friendly manner but I know it's the gospel truth. It's time for dormy, blind, unwise and Igbo efulefu to wake-up from their slumber and team-up with IPOB and other Biafra agitators to liberate the land before it is too late. After islamization, you'll be forced to worship their false and wicked Allah. Enough word for the wise. Beautiful piece. God forbid that we will have to fight these parasites. We will simply overwhelm them intellectually. They won't know how to fight back. We must never engage Nigeria in physical violence. Most Nigherians have nothing to lose. Especially, Buhari. Fantastic write up.